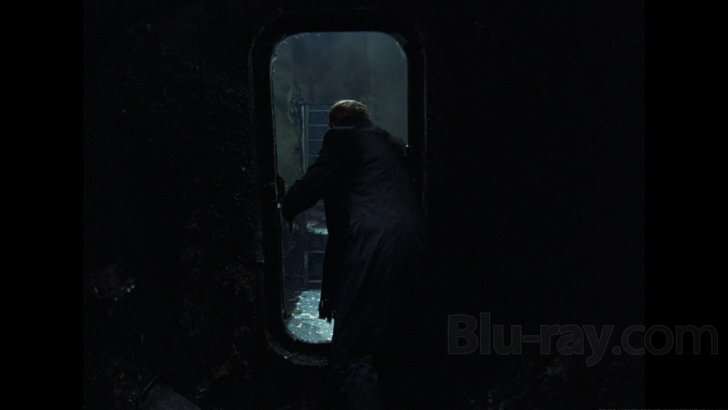 It’s one of the most mysterious places in all of cinema. Some say that wishes are granted there. Some say it can swallow human beings whole, and that is why so few return. For several decades, it has challenged travelers; there haven’t been many easy roads for finding it, and when they get there they’ve found it in poor condition. 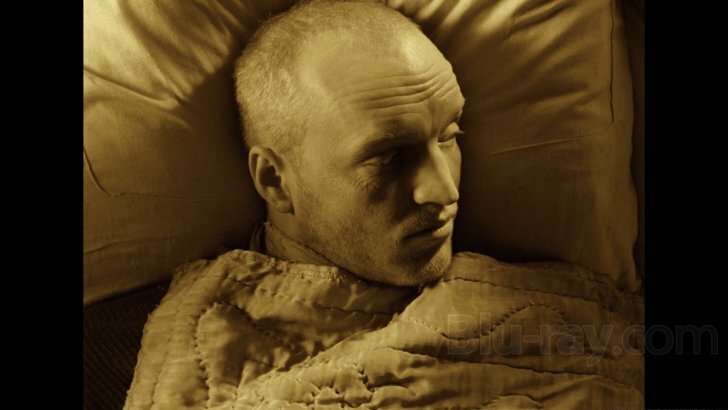 But, thanks to the cinematic saints at The Criterion Collection, Stalker, Andrei Tarkovsy’s beloved science-fiction classic has been restored and released for movie lovers everywhere. Now we can travel with the Stalker himself, sneaking across heavily guarded borders and out into the wilderness in search where we learn, for better or worse, the secret of our deepest longings. There is a lot going on in Stalker; you just have to engage, to ask questions about what’s happening. If a scene shows you some passengers on a train just watching the countryside pass by for several minutes, ask yourself about everything: the sound of the tracks rattling under the train, the strangely hypnotic quality of the rhythm, the reason why the camera is zooming so tightly on the characters’ heads instead of bringing the scenery into sharp focus. I frequently pushed the “Pause” button this time, rewinding scenes so that I could pay attention to the specificity of the screenplay after finding myself distracted by the sound design and visual composition. It’s rare, that sense that a movie is so spacious that you can focus on new things every time. And this time, I’m finding the film to be strangely personal. What happens in this film? A brooding man known as a “Stalker” — in the sense that he “stalks” a mystery — wakes, rises, and ventures away from home for an excursion that turns out to be a kind of routine. There is some angst in the fact that his vocation draws him away from the woman he loves. He’s called (by what, we wonder?) to take others into a strange, foreign territory in search of an epiphany: a revelation of meaning and purpose, and the fulfillment of their most fundamental longing. 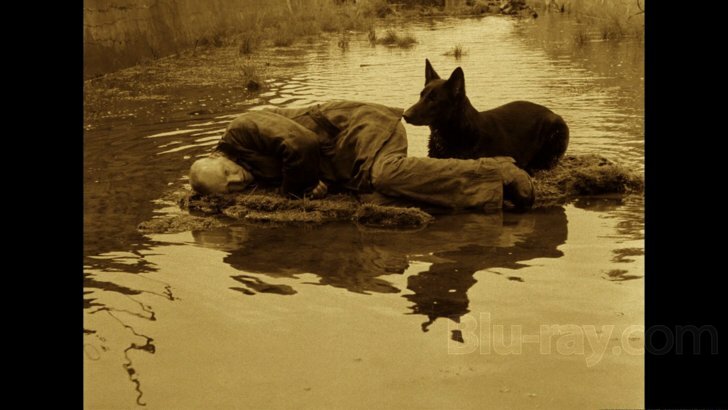 Stalker is the most self-serious version of a genie-in-a-bottle story I’ve ever encountered. 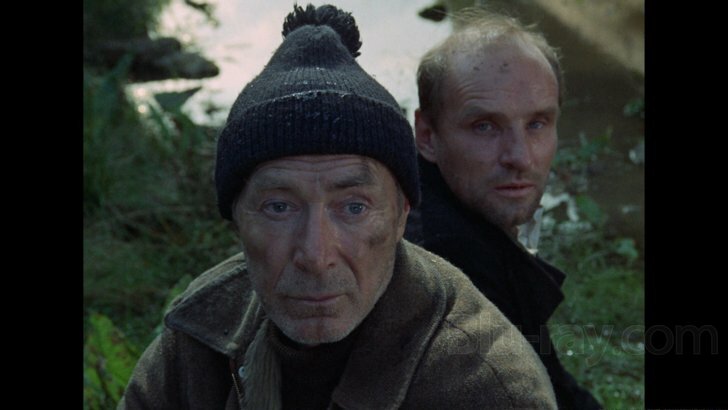 The travelers — the Stalker (Aleksandr Kaydanovskiy), the Writer (Anatoliy Solonitsyn), and the Professor (Nikolay Grinko) — wander. They get lost. They find a path. They draw near to the place where they hope they will learn something. Their surroundings may not seem that alien, that spectacular — but the degree to which they do seem so is driven by the quality of the travelers’ attention. I’ll leave you to discover what becomes of the Writer and the Professor — what their longings are revealed to be, what their intentions in making the journey are really about, and what becomes of them. The Stalker, though, seems to return with a newfound sense of his own fundamental longing. This self-knowledge, this renewal of purpose, seems to make a kind of contentment possible that he lacks at the beginning of the journey. And it has everything to do with recalibrating his heart, with recommitting himself to his wife and to his daughter, a strange child who seems to be have been both cursed and blessed by her father’s vocation. And as I watch, I am startled to find that this film, which I remember as being such an arduous subject of study suddenly seems accessible, welcoming, fitting me like a heavy coat for a harsh world. Where am I right now? I rose this morning, I gathered up what I need for a venture into “the wilderness” (books, devices, chargers, a water bottle). I headed out of the house, although I wasn’t happy about leaving my wife’s good company. I wandered. I got lost and wasted time (some of it on social media, some of it in traffic). I found a path into the novel I now want to write, and searched for that sense of discovery and joy that tells me I’m moving in a rewarding direction. And when I came home, I was glad to be home, I was filled with a renewed sense of love and gratitude for my wife, and the fierce attention I gave the world around me and my work on the page was then refocused on her, and I saw her better than I might have seen her if I had merely stayed home in her company. It seems like a routine for the forgetful, for the foolish. Why do I have to go and come back in order to really feel at home? But I do this. I do it again and again. I don’t know how to explain why, except to say that I often come home with renewed perspective, with renewed appreciation to the blessings I’ve been given, with renewed gratitude for the intimacy of my marriage and the possibility of rest. And in those excursions through other worlds — ferryboat rides across Puget Sound and back, hikes along beaches or through quiet forests, long drives through unfamiliar neighborhoods, or long stays at local coffee shops and pubs where my journey takes me into texts or music or conversations — I find the vocabulary I need to express what I am learning. I find materials for my art. I love the double meaning of “end” in those lines: He will not cease from exploration, but the end — the purpose — is to apprehend the truth of what has been before him from the start..
Today, I find my way to a view of the water, and I open my old, bent, underlined copy of Madeleine L’Engle’s Walking on Water: Reflections on Faith and Art. It’s been several years since I devoted myself to writing a new novel. I never meant for such a lapse to occur. But I know what caused it: I lost the support that, for so many years, had made “being time” possible. My day job had been a joyous, fulfilling experience of teamwork, creativity, camaraderie, and creative freedom. When the work load became unsustainable and people started getting sick, my own health and spirits suffered. I lost the strength to write. Since then, I’ve been fighting for a life in which I can recommit to regular writing. I am so grateful to the Looking Closer Specialists — some readers of my work who recognize the time and resources that it costs me to keep this site alive. They continue to donate generously, in small and large amounts, and those contributions are helping me find my way back. But the windows of time available to me are still small. Frustration frequently overcomes me, sinks me, makes me wonder if my creative life is over. I’m expecting myself to return to my best immediately: a level of high productivity, pages and pages of good writing. It isn’t working. And Madeleine L’Engle has reminded me why. I wrote Auralia’s Colors and its sequels when I had time during my day to go stalking: to take long walks, to sit outside during my lunch hour, to spend substantial time in prayer, to pay attention to details and colors and natural forces. I need my being time: the hours that are necessary for exploration, for contemplation, for stalking new ideas. And if I want to offer something that I haven’t offered before, I have to take the time to explore new territory, to have days where I walk what turns out to be a dead end, to wander and suffer uncertainty about the value of what I discover. And I want to bring readers with me, so that they too have time to discover new glimpses of the truth. Artists, scientists, theologians, followers of Jesus — all truth-seekers need time for wandering. For stalking. I recently asked Linford Detweiler of Over the Rhine — one of my favorite songwriters, and an artist whose faithfulness to his work is constantly inspiring — how his new projects are developing. He responded, “It’s a time of hunting and gathering.” I’ve heard this from him before. It means that he probably doesn’t have any new songs he’s ready to share with me. But he’s exploring and bringing ideas home, ideas that may, in time, become a song worth sharing. In the past, those seasons have been short or long, but they have always led him to rewards worth sharing. I told him to take his time. So why am I finding it so difficult, now that I have some windows of time, to take the time that I need for stalking? I’m beginning to believe, with some chagrin, that it has something to do with having achieved a dream, having succeeded for a time. I grew up dreaming of writing an original fantasy series. I grew up dreaming of working as a movie critic. Both of those dreams came true for a time. And it did, for a while, wreck me. The exhilaration, the waves of relief and joy and gratitude that engulfed me — those have passed. And now I’m back at the beginning. I want to get that back. I’m not happy to find myself back in the fog, in a place where I’m intimidated by unknowns and possibilities. And, as I get older, I have an increasing sense that my time is running out. How do I choose what to do? In Art and Fear, one of those little books that artists share with one another like precious secrets, David Bayles and Ted Orland write that this is a common experience for artists who have, at one time or another, finished something. “There’s a painful irony to stories like that, to discovering how frequently and easily success transmutes into depression” (11). I want to get back to that high of riding on a vision that is flourishing. Instead, I’m staring at a blank canvas. An array of embryonic ideas buzz about the room. I hold my net and feel paralyzed. I know that the path forward will involve stalking, swinging, missing, stalking, swinging, missing, and only occasionally catching anything worth keeping. The function of the overwhelming majority of your artwork is simply to teach you how to make the small fraction of your artwork that soars. One of the basic and difficult lessons every artist must learn is that even the failed pieces are essential. X-rays of famous paintings reveal that even master artists sometimes made basic mid-course corrections (or deleted really dumb mistakes) by overpainting the still-wet canvas. The point is that you learn how to make your work by making your work, and a great many of the pieces you make along the way will never stand out as finished art. The best you can do is make art you care about — and lots of it. The rest is largely a matter of perseverance. 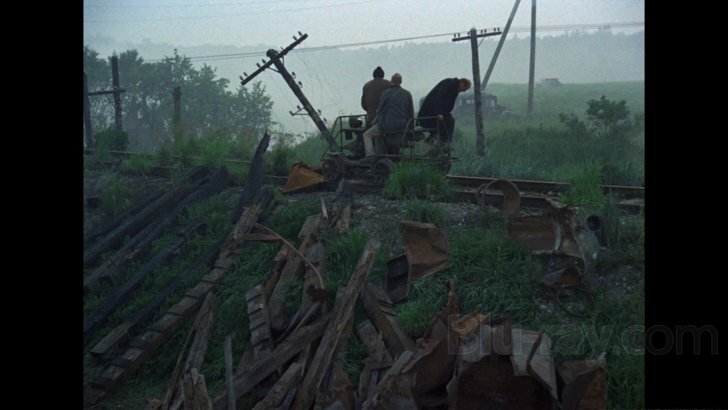 Is it any wonder that Tarkovsky spends so much time and attention on close-ups of the Stalker’s head, the Writer’s head, and the Professor’s head? Aren’t these domes of bone and brain the true location of “the Zone,” the battlefields where seekers struggle to break free from their fears, their delusions, and their vanity in order to open themselves to revelation and the change that it can bring? 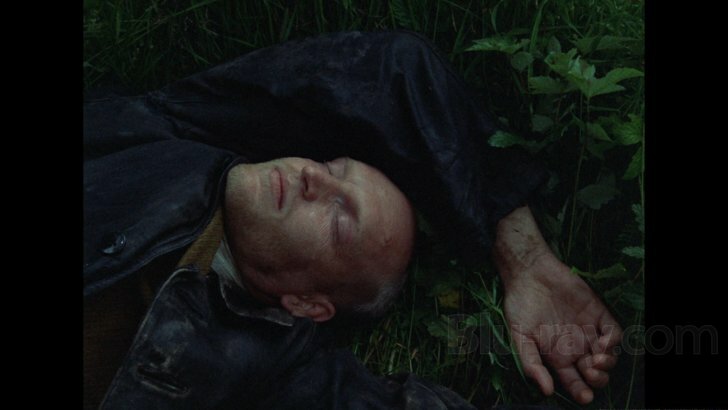 At the end of Stalker, the child is strange and quiet, but exercising mysterious powers. I am not a parent. I’m not sure what this movie means to parents. But I know what it means for me, right now. My next story, whatever its future, whatever it might come to mean, is growing and changing and behaving in mysterious ways. That is, in part, because I’m doing what I’m supposed to do: I’m exploring and making something out of my exploration. And the story is already unsettling me, wanting to behave in unexpected ways. That’s just one of the paths of contemplation I wander as I watch the film this time. But it’s the one that brings me much closer to the film this time, to a place where I can honestly say that the movie has become more than just an academic subject for this film student — it’s become a companion, a teacher, a book of wisdom. A mirror. So today, it’s an hour in a secondhand bookstore. Okay, two secondhand bookstores. It’s taking the time to read a daily scripture passage and an homily on my “Jesuit Prayer” app. It’s taking an old, unfinished story and rewriting a chapter of it in the voice of a strange new storyteller. 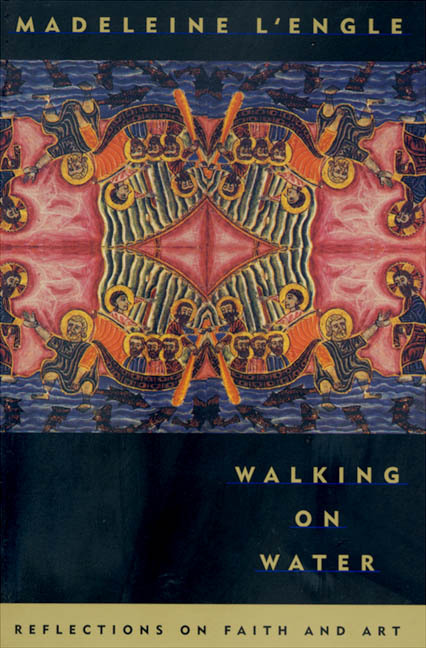 It’s a walk by the water, with a copy of Walking on Water in hand. 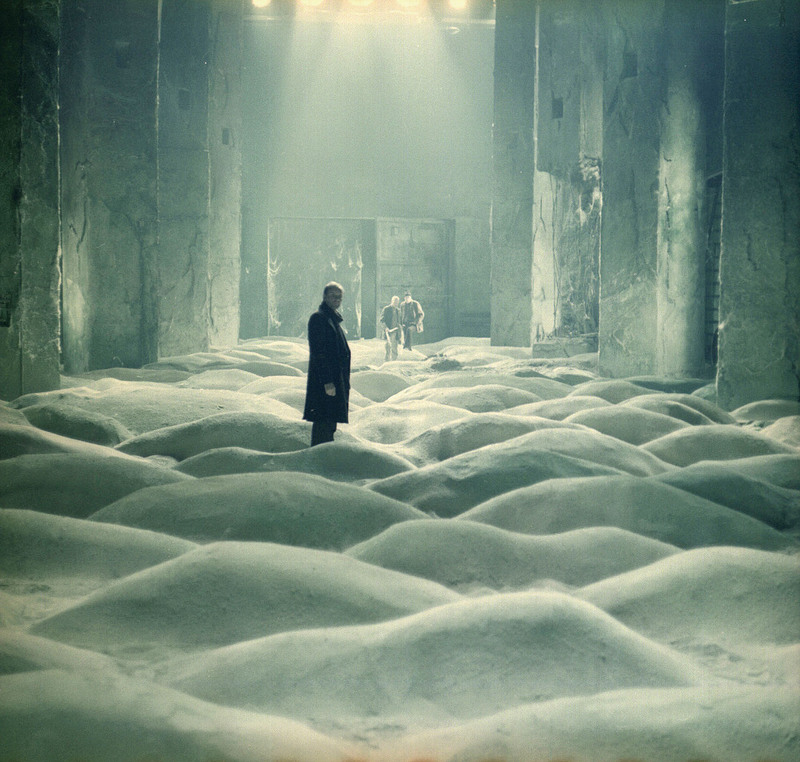 It’s a time of stalking, with Tarkovsky’s Stalker still flickering behind my eyes.